Welcome to Ace Jackalope's 13 Days of Halloween - a haunted baker's dozen or a fortnight-minus-one days of posts that touch on something scary or at least atmospheric of All-Hallows Eve. Some of these will be brand new posts; others will be reminders of past creepiness. 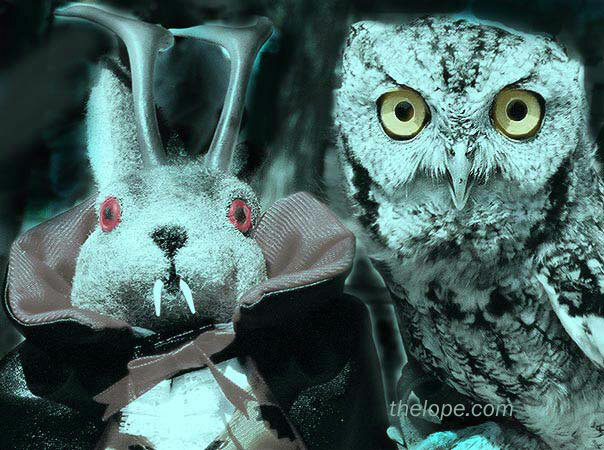 Now, the only thing wrong with Bram Stoker's novel, Dracula, was that Stoker didn't have some blogger-geek and a jackalope to illustrate it. Twice we have visited Dracula, to mine from its Stygian depths photo-inspiring quotes; this was our first attempt. Enjoy this Halloween hors d'oeuvre we called Nosferatulope back in 2005.